Product code: ES7813 Categories: Antique, Antique Engagement Rings, Antique Rings. 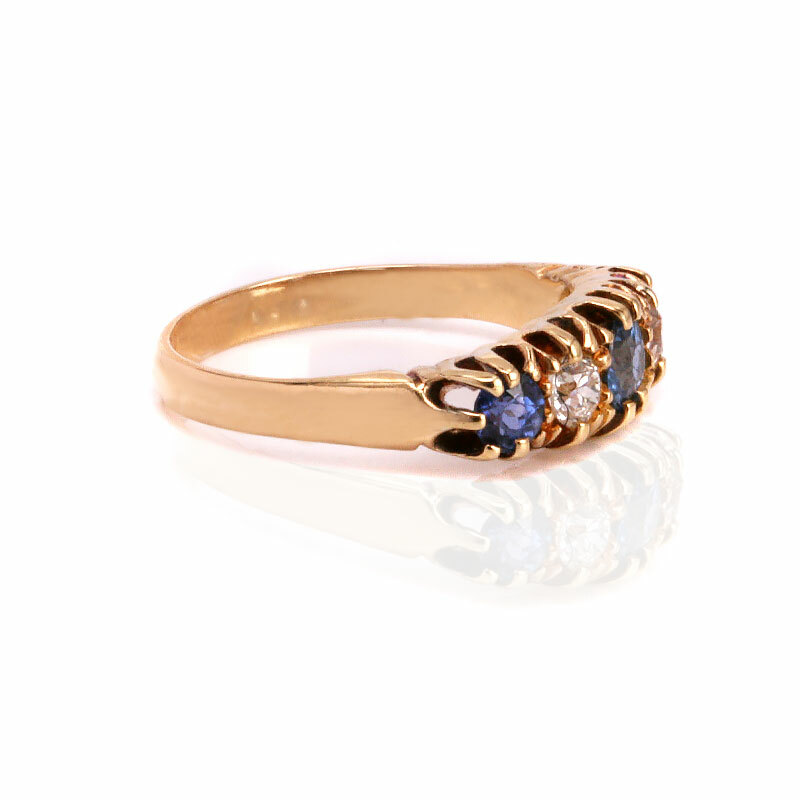 Absolutely perfect for any occasion, this antique 18ct gold sapphire and diamond ring made in 1913 will suit any finger including making a wonderful antique sapphire and diamond engagement ring. No matter the occasion, the simple elegance of this ring will always stand out on the finger thanks to the beautiful blue from the sapphires and the sparkle from the diamonds. Combine this with the multiple claws that not only securely hold the sapphires and diamonds, but also make up part of the design and this ring is one that will always be admired. The three natural sapphires total 1.04 carats and are all perfectly matched in colour and transparency and have such a fine blue colour to them. And then the sparkle from the diamonds adds that extra element of charm and character and these diamonds total 0.32 carats. At the centre the ring measures 6.2mm wide by 19.1mm across and will sit so well on the finger by itself or with a wedding band along side. Considering that this ring is over 100 years ago and still looking so elegant is a real wonderful feature of wearing a genuine antique ring on your finger. A very refined and elegant design such as this will never go out of fashion or style. Set with beautiful natural sapphires and diamonds, this ring will suit any finger including making a wonderful example of an antique sapphire and diamond engagement ring. Made in 1913, this is a very elegant and refined antique sapphire and diamond ring in perfect condition.